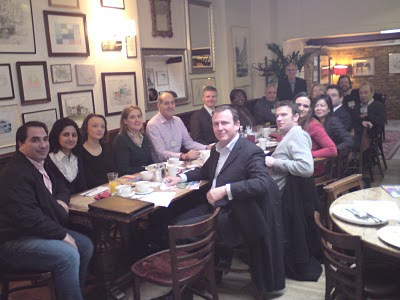 The Cowan Report: "The Best Business Networking Breakfast In West London"
"The Best Business Networking Breakfast In West London"
At 6.45 this morning I wandered, slightly bleary eyed, into the Stonemasons Arms on Cambridge Grove, Hammersmith. It’s not what you’re thinking! I had kindly been invited to a business breakfast put on by BNI International. BNI aims to provide exposure for local business people. It is the largest business networking organisation in the world and offers members the opportunity to share ideas, make new contacts and most importantly win business referrals. Almost half of all people in the UK are employed by small and medium sized businesses. They are an essential part of our economy. I was happy to be there and offer my support. Pooja Jeejeebhoy also attended. She is a Local Business Manager from Barclays Bank You can email her by clicking here or phone her on 020 8273 6540. I hope I haven't missed anyone out and I hope they all have a great year of business. You can click here if you'd like to find out more or have your business get involved with BNI West London.